"Whatever it is, it is." 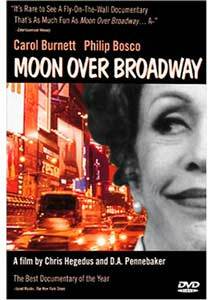 In the mid-1990s, Ken Ludwig's farce Moon Over Buffalo headed to Broadway under the direction of Tom Moore, starring Philip Bosco and Carol Burnett as a pair of would-be legends of the American theatre. While the production was in rehearsal, documentary filmmakers D.A. Pennebaker and Chris Hegedus chronicled the mounting of this $2.3 million dollar stage production. The film covers the process in detail, from the first cast read-through to the gala opening night. But the road from page to stage is rarely without its bumps, especially when working with a brand new script, and Moon Over Broadway gives us a rare glimpse of the stress, conflict and pressure involved. Everything starts with the script, as they say, and playwright Ken Ludwig (who also wrote the popular Lend Me a Tenor) spends most of his time onscreen sweating it out, rewriting the ending and trying desperately to "write funnier" as he turns out new pages for the cast to absorb. It's painful to watch joke after joke land with a thud during preview performances, and a few lame gags (like an elderly character's confusion of "hearing aid" for "lemonade") never do get fixed. Meanwhile, director Tom Moore has to contend with television star Carol Burnett, returning to Broadway after 30 years with a pronounced tendency to paraphrase lines and "milk" the comedy, and a grumpy Philip Bosco, whose lead role began shrinking after Burnett was cast opposite him. The actors argue with the director and the playwright, notes go unheeded, and tensions build. Behind the scenes, costume designer Bob Mackie has to deal with "incompetent" dressers responsible for the show's frequent quick changes, while producer Rocco Landesman frets over the show's commercial chances. Early reviews during out-of-town previews in Boston are mixed at best, and the pressure to make the play a hit becomes palpable as opening night approaches. Finally, the show opens in New York, again to mixed reviews. It's the human moments that make Moon Over Broadway as entertaining and quietly profound as it is. An unexpected bright spot appears when a scenery-moving winch gives out, forcing director Moore and star Burnett to take to the stage for ten minutes to keep the crowd occupied while repairs are made. Burnett is in her element here, entertaining the audience with improvised answers to their questions, and a surprise appearance by Bernadette Peters in the audience makes this sequence a valuable morsel of show-biz history. We're allowed to watch producer Landesman and his team combing the lukewarm critical notices for suitable blurbs, and given a brief glimpse of playwright Ludwig voicing all of his characters himself as he reworks a troublesome scene. Everyone complains and beats themselves up as the show staggers and wheezes but slowly takes shape, and the film is a vivid record of the proverbial blood, sweat and tears that go into such a production, even an unsuccessful one. Moon Over Buffalo rode for a while on the popularity of its stars, but closed less than a year after opening. Fortunately, Moon Over Broadway captures the painstaking efforts of the show's cast and production team for posterity. It's fascinating, funny, emotional stuff, well worth a viewing. Image Transfer Review: Docurama presents Moon Over Broadway in its original 1.78:1 aspect ratio, in letterboxed nonanamorphic format. The low budget documentary was shot on grainy 16mm film, with some archival video material included, and the image quality is passable but unimpressive. Some dark scenes shot with natural lighting are EXTREMELY grainy, and there's some red/blue false-color aliasing during the video-originated closing credits. But the production as a whole is certainly watchable, with no distracting digital compression flaws. Audio Transfer Review: Moon Over Broadway is presented in Dolby Digital 2.0 Surround format, drawn from the film's original Dolby Digital soundtrack. It's a simple mix, with "live" documentary audio centered and some street and audience ambience engineered to fill the broader soundstage. The filmmakers' use of digital recording technology keeps voices crisp and comprehensible, greatly reducing the hum and echo common to documentary material. An unassuming but impressive audio presentation. Extras Review: Docurama supports Moon Over Broadway with 12 picture-menu chapter stops and a number of extra features. Brief on-screen biographies (with some filmography information included) cover directors D.A. Pennebaker and Chris Hegedus, as well as producers Wendy Ettinger and Frazer Pennebaker. A screen of Weblinks (also accessible as a DVD-ROM feature) provides access to the official Docurama site, as well as a Pennebaker site that was not responding properly when I tried it. DVD production credits list the names of the people responsible for Docurama's DVD presentation, and a set of Docurama Previews includes trailers for the documentary movies Regret to Inform, Bob Dylan: Don't Look Back, and Paul Taylor: Dancemaker, all in 1.33:1 full-frame video-mastered format. The most substantial DVD extra I've seen in a while is the Cast and Crew Commentary, recorded several years after the film was made and the Broadway run of Moon Over Buffalo had closed. "Cast members" including Tom Moore, Ken Ludwig, Philip Bosco, and Carol Burnett share their thoughts about the movie and the show itself, with additional comments from the show's producers Heidi Ettinger and Elizabeth Williams and the film's directors Pennebaker and Hegedus and producers (Wendy) Ettinger and Pennebaker. Some of the comments are screen-specific, others are excerpted from interviews; thankfully, there's a video introduction recapping "who's who," and each participant's name is stated before they speak, avoiding potential confusion. The assembled "commentary" is candid and frank, and provides a great deal of insight into the participants' thoughts and moods during the stressful rehearsal period, from a more relaxed, forgiving and occasionally regretful perspective several years later. It's essentially an audio documentary, another layer of material that's very nearly as valuable as the film itself, and it brings this disc's Extras grade up significantly. The behind-the-scenes documentary Moon Over Broadway observes the high stakes process of mounting a Broadway production with humor, intelligence and humanity, and Docurama's DVD features a valuable retrospective commentary to boot. Recommended.